we can put great sound in any vehicle. JC Audio has been recognized year after year for outstanding excellence in service and installation. We have M.E.C.P. certified technicians that are highly skilled in mobile audio. We take pride in every job we do big or small. Weather it be Car, Truck, Bus or Boat. 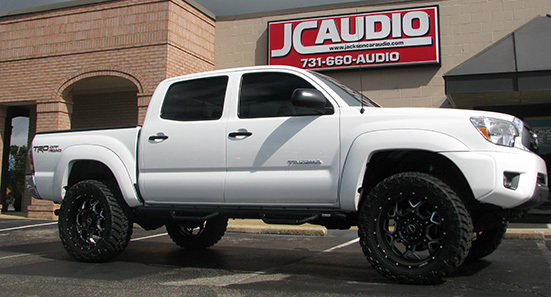 JC Audio can deliver custom sound and video systems to any type vehicle. Our MECP certified technicians have the training to create amazing sounding and awesome looking custom installations. Our in house speaker enclosure shop can fabricate any type of inclosure's using a wide verity of materials. Backup cameras are a great safety measure for any vehicle, Let JC Audio make you and your family safer on the road. With only the best most reliable brands to choose from, JC Audio has the experience to make sure your backup camera installation is as quick and safe as possible. We install Security and Remote Start Systems that use the latest Technology. A remote start system will start your vehicle and get it nice a cool for you in the scorching summer and toasty warm in the freezing winter. And with the top of the line Security systems we install at JC Audio we make sure you install is flawless because we know its our work thats helps keep you,your family and your property safe. For years, it had been Kip’s goal to restore the truck given to him by his grandfather and add a little something special. That’s when he decided to come to Jackson Car Audio. 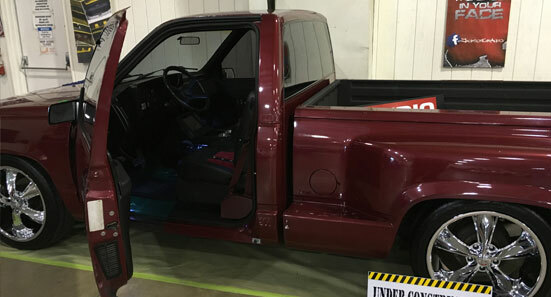 Kip, a student and worker in the medical field in Jackson Tennessee, knew he wanted something unique and special for the truck, but couldn’t quite put his finger on exactly what that was so he brought it to us and together we designed a new life for this one time work truck that included a custom audio system! The process started by sketching out a design for a custom fabricated, one off, center console that would house the electronics for the system and be the focal point to the interior of the truck. 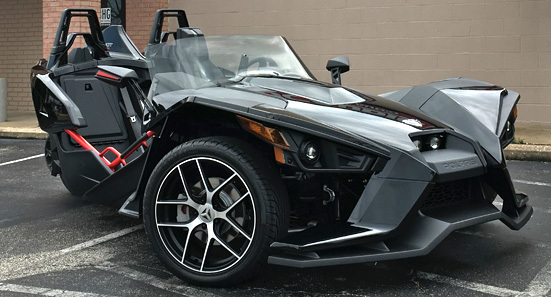 Polaris® makes a ridiculously fun, wild looking ride called the Slingshot. Its unique looks and stellar performance and handling make it a blast to cruise around in, but the audio system it comes with from the factory just doesn’t do it justice. One local business owner, frustrated with not being able to rock out in his favorite ride, contacted JC Audio to change that – and to create a system that would complete the package. The crew evaluated the vehicle completely, discussed some goals and desires of the owner, and created an awesome upgrade package to solve every issue he had. With their expertise in integrating factory radios with awesome aftermarket speakers and amplifiers. JC Audio worked with a client to produce a beautifully installed, very powerful system, while retaining all vehicle features and functionality, and minimizing the effect on available space. The results created a rolling showcase of high-output amplifiers and rich-sounding speakers that dazzles you when cranked! Trucks are notoriously loud, because let’s face it – they are meant for work, not necessarily luxury. As part of the audio package, JC Audio used special material to dramatically reduce road noise and vibration, and special isolation rings around the high output drivers to direct the music inside the vehicle cabin where it belongs, and other noise out.